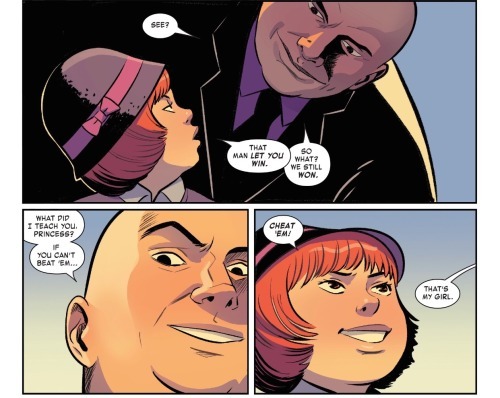 Things go from bad to worse as Moon Girl finds herself facing off against not only the Kingpin of Crime and his bratty adopted daughter, but also the dreaded Wrecking Crew. 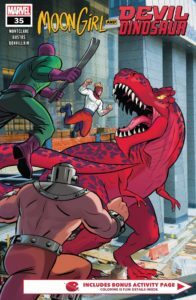 And rather than having the powerful Devil Dinosaur at her side, Lunella is instead stuck with far less useful Devin Dinosaur. All from the creative team of Brandon Montclare, Natacha Bustos and Tamra Bonvillain. Lunella is the smartest person in the world. Still, when one is only nine years old, being so smart can be something of a double-edged sword. A person this age can know and understand things on a cognitive level but not yet posses the emotional faculties and sense of wisdom needed to fully cope with this knowledge. And to make things worse, there is the powerlessness of being a child, so often unable to do anything about all this information and the multitude of problems and injustices that are perceived and understood. This is true for many kids who are precociously gifted in terms of their intellect and is especially true for Lunella. 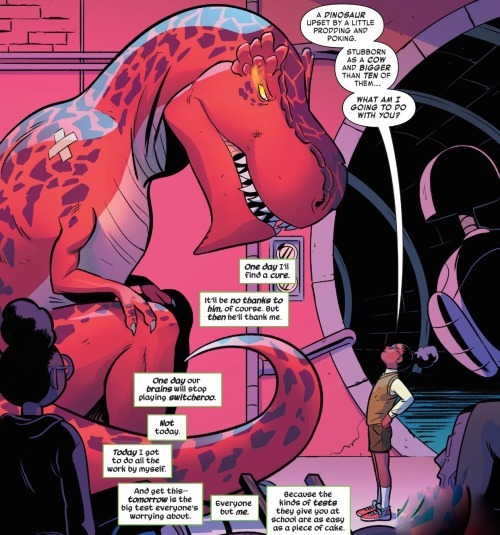 In Moon Girl and Devil Dinosaur, this dichotomy has been metaphorically put forward by way of Lunella’s special relationship with Devil Dinosaur. While Lunella represents pure intellect and the capacity for dispassionate and pragmatic analysis; Devil Dinosaur represents raw id, emotion and the tendency to leap before looking. And this metaphor is solidified by the way in which Lunella and Devil D will periodically switch bodies… trapping Lunella’s consciousness in Devil D’s body and his in hers… always at the most disadvantageous of times. Lunella has all these important thing she feels she must do… yet all too often right before she can get them done she will suddenly find herself in the powerful but cumbersome body of Devil D. While Devil D’s mind ends up in her body causing all manner of embarrassing mayhem and usually a dashing of her intricate plans. Well, Lunella has had enough of it and she has decided to use her super intellect to devise a plan to undo this bothersome dilemma. She’s built an elaborate scientific device, a machine meant to prevent her and Devil D from switching consciousnesses. But something was wrong in her calculations. 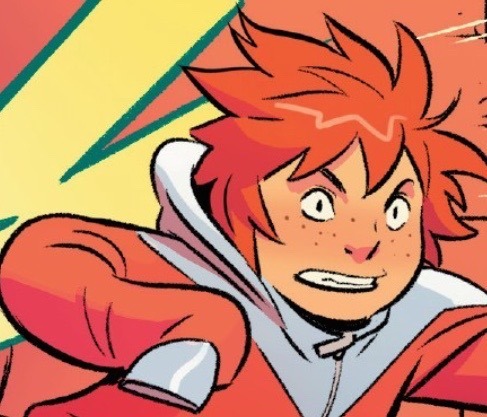 Something malfunctioned and instead of preventing their mind switches, the result ended up transforming Devil D into a rambunctious nine-year-old boy with wild red hair and the mind of a tyrannosaurus. All of this has occurred in the backdrop of a serious threat to Lunella’s school. Somehow the villainous Wilson Fisk, The Kingpin of Crime, has snaked his way into becoming the Mayor of New York City. He’s also introduced his newly adopted daughter, Princess, and together they have set about a plot to shut down those public schools who are falling behind in terms of meeting some type of newly devised metric of adequate academic achievement. No, this isn’t how municipal politics works… mayors don’t really have the power to close public schools at a whim, but it’s comics so lets just go with it. 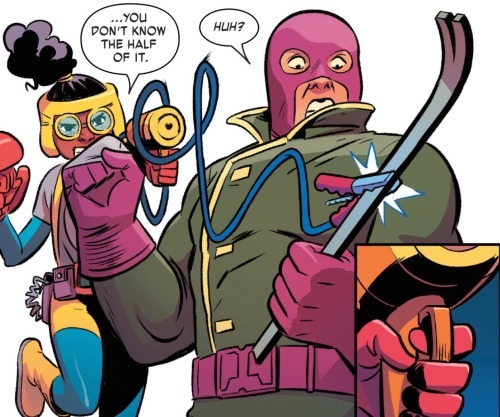 It remains unclear why it is Fisk and Princess are so intent on shutting Lunella’s school, but I’m sure there is some sort of nefarious purpose to it all. 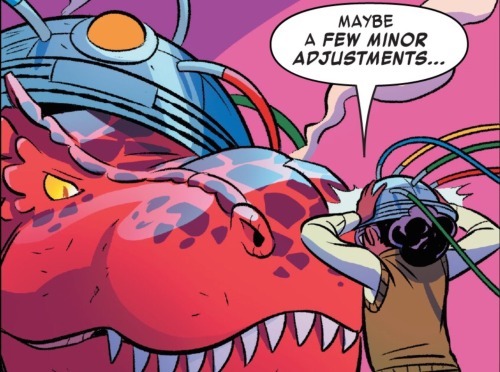 Well, Moon Girl is able to hold her won against The Wrecking Crew despite not having the aide of her dinosaur buddy. Still, she knows it’s a battle that she cannot win and tries to retreat. And it is here that she gets wise to the Crew’s ulterior motive… that they’re also here to destroy the school. She can’t let this happen, but shat can she possibly do to stop it? In the midst of all this, Devin (the little boy version of Devil Dinosaur) ends up getting hurt. This appears to trigger something in him and he transforms into his original dinosaur-sized self. Now the tables have turned! 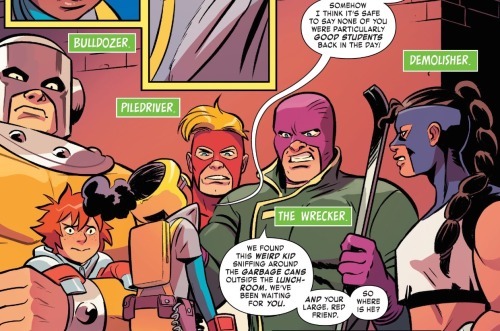 Moon Girl and Devil Dinosaur are able to chase off the Wrecking Crew, but a great deal of damage to the school has already been done. The battle is won, but the way is far from over. Meanwhile, back in her laboratory, Lunella continues to attempt to refine her invention and devise a means to prevent the mind switching between her and Devil D. Devil D is none too please over then, nor are Lunella’s two ersatz lab-assistance, Doom Head and Lunella-Bot-7. These two advise that Lunella needs to accept her situation for what it is. One cannot change who they are and sometimes it is the more prudent move to learn to live with such matters rather than try to change them. Yet Lunenlla isn’t hearing it. She’s set on completing this process and endeavors through numerous iterations of the process each time ending in failure. Ultimately, she realizes that this problem is not going to be fixed today. Perhaps one day she’ll be able to figure out a means of achieving her goal, but for now she has a more pressing matter to attend to. And it is here the the issue comes to a conclusion with he promise of continuation in the next installment. There is some very fun action and neat character development in this issue; and of course there is the truly brilliant art and colors from Bustos and Bonvillain that makes every issue a joy to behold… Although the installment does suffer a bit from having to adhere to the new normal in comics. That being that the stories are set up as arcs that will neatly fit in republished trade paperbacks. And to this extent, there are often issues in the middle that frequently feel like filler… a way of extending the middle of a tale without adding significant material to the overarching plot and premise. 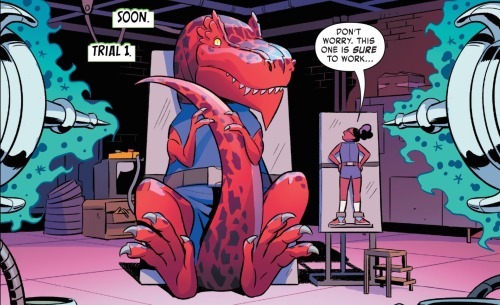 This is not something unique to Moon Girl and Devil Dinosaur. It is pretty much endemic to nearly every super hero comic on the stands. Brendan Montclare is a hugely talented writer and one of his many skills is the capacity for succinct storytelling and the ability to get to the point in a clear, expedient fashion. And this acts to make these ‘filler issues’ a touch more vexing. The thematic that was so solidly detailed in the previous issue is pretty much reiterated in this issue. Although it’s possible I am being unfair and losing sight of the fact that I’m an adult reading a comic aimed toward both younger and older readers alike, Younger readers may very well benefit from having these themes reiterated, further hammered home. And I should clarify on what I see as this theme. That being that Lunella values her intelligence but undervalues her emotionality. These distinct features are bifurcated in her relationship with Devil D. She wants to fully separate the two, believing that she will be better off without her unruly feelings of emotionality and having them fully transferred over and consolidated within Devil D. Doom Head and Lunella Bot 7 act as the foils to this folly. 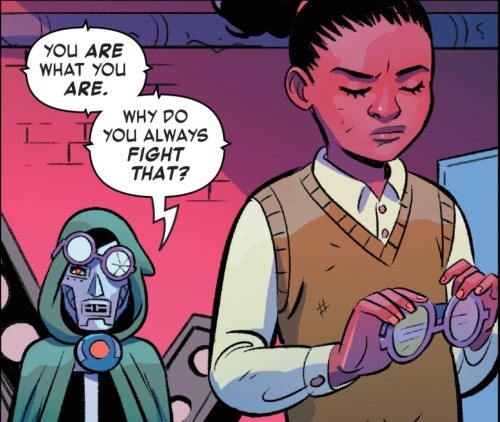 They argue in their own ways that Lunella needs to be true to herself, accept who she is and realize that intellect combined with emotion creates a matrix that is greater than the sum of the individual parts. It is a truth that I’m sure she will ultimately come to realize… of this I have little doubt. But she is only nine, and has many mistakes to make before she fully accepts this important fact of life. Good stuff. Once again a highly recommended issue with looks of cool action, some good laughs and a poignant theme. Three and a half out of four Lockjaws!